The N19 postcode covers the areas of Upper Holloway and Archway. It also veers into parts of Crouch Hill and Tufnell Park. It neighbours on Crouch End in the North, Highgate in the West, Kentish Town in the South and Finsbury Park in the East. The density of population in N19 is relatively high. As it is close to Central London the vast majority of households are either in flats, terraced homes or shared accommodation. The average income in N19 is considerably higher than the London average with large parts of N19 being almost exclusively A and B social grade. N19 is very well connected to both Central London and other harder to reach places in and around London. Archway and Tuffnel park underground stations provide access to the Northern line and Crouch End and Upper Holloway stations to the Overground. Even though the population density here is relatively high, there is still a notable number of green spaces here. Dartmouth Park, Whittington Park, Ethorne Park and Waterlow Park provide some refuge from the hustle and bustle of a busy London borough. N19 also shares the Highgate Cemetery with it's Western neighbour. As such it includes the tomb of Karl Marx. Holloway Road and Archway Road are lined with businesses, local restaurants, gyms and cinemas. Our mapping system covers the whole of N19 excluding all undeliverable buildings, businesses and local authority housing. N19 basically consists of patches of all three types of properties and we have gone through an extensive process of eliminating the areas that are not suitable for leaflet distribution. This is necessary in parts of London that are built like N19 is. 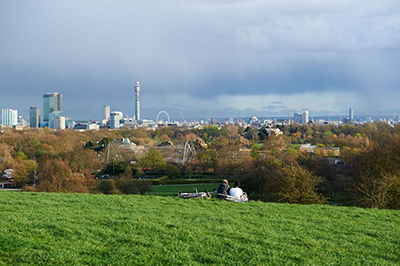 We break down each postcode in London to smaller areas of approximately 5000 leaflets. These tend to be groups of relatively homogeneous demographics. This allows our experts to guide you when looking for the best areas for you to target. You as the client have complete control when deciding which areas should be targetted by your leaflets. We can however provide guidance and help you make the best decisions when it comes to both location and timings of your campaigns. Our service is therefore as personalised as it gets in our industry. We also have the most transparent tracking system in London. All our distributors carry GPS devices when delivering. The files from these devices are send to you at then end of your campaign. They are provided to you in the form of a high definition map with a snail trail mapping out the path of each distributor that worked on your campaign. These are time stamped and are in high enough resolution to allow you to zoom in and see the worker walking up to each individual house. You will also be informed when each distribution round starts and finished every day. This will be done through our Mercury System. You will receive information about each distributor and when and where they are starting and finishing your deliveries. This provides an unparalleled level of control and understanding of the progress of each campaign you decide to run with us.